Social Finance, (SoFi), is a digital finance company, founded in 2011, that works to empower its members to accomplish their goals hence achieving financial independence by offering various types of financial products. Unlike traditional banks, SoFi takes a different approach to lending and does not adhere to bank hours; they provide support seven days a week. It’s a modern company encouraging the shift to a bankless world. Through their products of saving, investing, borrowing, and protecting, it has given its members fast accessibility to tools to manage their finances right. Becoming a member of the SoFi community is one of the best decisions one can make. From getting out of high-interest debt to managing your wealth, SoFi is here to assist you in getting your money right. Being a non-traditional company, customers can get access to all financial products offered by SoFi easily with less or actually no paperwork at all. SoFi looks more than just credit scores and considers factors like career experience, regular monthly income compared to expenses, individual financial history, and educational background. To be considered and qualify, a borrower must be a U.S. citizen and meet SoFi’s underwriting requirements. 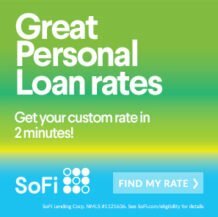 SoFi offers unsecured personal loans with competitive fixed and variable interest rates and stands apart in the marketplace when compared with other competitors. You can apply for the loan and use the borrowed funds for personal purpose and depending on your requirement including debt consolidation, medical expenses, and home renovations. With rates as low as 5.9905% APR to 16.240% APR, one can borrow starting at $5000 up to $100000 and choose a repayment term depending on your financial situation between 2 years to 7 years. Also, one can use the loan to pay off high-interest credit cards or make any personal purchase. SoFi gives its clients personal loans that are entirely fee-free and without any hidden charges. You can be eligible to get a loan from SoFi if you have good or excellent credit scores. The minimum credit score required is 680 or above to be considered for a personal loan. Also, factors such as income, career experience, and creditworthiness are considered. If you have high annual earnings with excellent credit history, you’re a suitable applicant for a SoFi loan. Unemployment Protection Program:- SoFi also offers some exclusive member benefits for personal loan borrowers like unemployment protection. In case you lose your job without your fault, you can apply for an Unemployment Protection Program, provided your loan account is in good standing. If approved for the program, your monthly loan payments will be paused max up to 12 months. Also, SoFi professional career team will help you look for a new job. Notice:- APR range mentioned above might change without prior notice, Visit SoFi for up to date information. One can save thousands of dollars by refinancing their student loan either by shrinking interest rate or tapping into unique and creative perks. SoFI has become the leading provider of student loan refinancing thanks to its low fixed and variable interest rates. For fixed rates, the Annual Percentage Rate (APR) range from 3.899% to 8.074% and 2.540% to 7.115% for variable rates when you enroll in an AutoPay. As a digital company, student loan refinancing can be done entirely online making the process fast and easy. Also if you apply for a student loan refinancing at SoFi, they do not charge application fees, origination fees, or any prepayment penalties for making early payments. SoFi also provides a student loan calculator on their website, to help you understand how much you can save by refinancing your current student loans with SoFi. SoFi allows medical/ dental residents and fellows to refinance their student debt before they become an attending physician or dental specialist for both federal and private loans and can reduce the monthly minimum payment to only $100 per month for up to 54 months. After the end of the residency or fellowship program, the loan repayment will resume as per the loan schedule, and the monthly payment amount will increase according to the loan term. SoFi offers loan repayment term up to 20 years with fixed and variables rates. Also, you can save 0.25% on the interest rate, when you enroll in AutoPay, to electronically deduct the monthly payments from your bank account. Everyone’s dream is to one day move in their own home. The process of acquiring a mortgage does not have to be stressful and expensive. With as little as 10% down on loans up to $3 million with competitive rates, no hidden fees or prepayment penalties, you can turn your dream of buying a home into reality. For just being a member, one gets a 0.125% rate discount on any additional SoFi loans. The process can be completed entirely online, but in cases where one-on-one assistance is needed, mortgage loan officers (MLOs) and loan specialist are standing by to help. SoFi gives its clients the freedom to choose the right mortgage for them based on their financial goals. Fixed Rate Mortgage:- With fixed-rate mortgages the interest rate on loan remains the same for the entire term of the loan. Furthermore, one can choose the duration of the loan as per their requirement, fixed 15 years term or 30 years term. For Example:- With 30-years fixed rate mortgage, the interest rate, and the payments will not change throughout the entire period of the loan. With15-years fixed rate mortgage; one can pay the loan off faster keeping a constant rate and payment. Adjustable Rate Mortgage:- With adjustable-rate mortgages the rate of interest on the loan changes after a specified duration eventually. SoFi offers two types of adjustable-rate mortgage, 7/1 and 5/1 ARM with 30 years loan term. For Example:- With 7/1 adjustable-rate mortgage with a 30-year term, in which the interest rate is fixed for the first seven years and after that changes every year. Apart from a home loan and mortgage loan, SoFi also offers mortgage loan refinancing at low-interest rates and without any hidden fees. You can also save money by refinancing your mortgage with SoFi, and they will make sure that the entire process is easy, hassle-free and transparent. SoFi invest platform has come up with multiple ways to invest, anyone with or without having any experience at all can use the platform for investing in stocks /bonds and exchange-traded funds. SoFi does not charge any transaction or management fees to the investor for using their platform. You can kick off with active investing and will be actively involved in it or go for the automated investing if you do not want to follow the market closely. In case, if you decide to begin with automated investing, SoFi will create and manage a portfolio for you and will assist you with the most essential part planning an investment goal, re-balancing, and diversifying your money across various types of financial investments. SoFi will invest your money in Exchange Traded Funds (ETFs) which is a simple and low-cost way to invest in a diverse portfolio of stocks and bonds. SoFi offers term life insurance to customers through a partnership with Ladder. With more flexibility, consumers can now calculate and get a quote for fully underwritten term life coverage that ranges from $100K to $8 million for 10 to 30 yrs. By partnering with Ladder, SoFi has streamlined the process for their clients, who are now able to easily increase or decrease their coverage over time, according to their necessities. With Ladder’s innovative platform, consumers can apply online and complete the entire process in about 5 mins and get an instant decision on whether they meet the eligibility requirements. SoFi offers parent plus refinancing, where you can refinance or consolidate your federal parent plus and private qualified education loans, it can save you money and streamline your payments. With the variety of options offered, you can quickly pick the plan that best suits your requirements, which will enable you to optimize your monthly payments, lifetime cost, and payoff speed. SoFi doesn’t charge any origination fees in most states it operates or any prepayment penalties. APR range:- Variable rates range from 2.540% APR to 7.115% while fixed rates are available from 3.899% APR to 7.624% when you enroll in AutoPay. SoFi Money is a combination of checking and savings account into one hybrid account. SoFi Money gives you a complete online banking experience on the SoFi powered mobile app, and you can manage your account and money anytime, anywhere, on the move at your comfort. SoFi Money does not charge any fees like account minimum fees, overdraft fees, ATM transaction fees or account maintenance fees, unlike most banks that charge account fees yearly. On the contrary, you can earn 2.25% Annual Percentage Yield on your account. SoFi Money account includes some great features, quick and easy signup process plus account opened in just 60 seconds. Additionally, with the SoFi Money Debit Card, you can make purchases and withdraw cash using ATMs worldwide that accepts Visa and get reimbursed for the fees in your account. Also, you can use the bill pay service for paying bills, write checks using SoFi Money checkbook or send money electronically to friends or family through the peer-to-peer function or by ACH online transfer. Funding Time Up to 7 working days*.